This surprisingly simple exercise measures the brain’s unconscious ability to filter out visual movement. The study shows that individuals whose brains are better at automatically suppressing background motion perform better on standard measures of intelligence. As expected, people with higher IQ scores were faster at catching the movement of the bars when observing the smallest image. The results support prior research showing that individuals with higher IQs make simple perceptual judgments swifter and have faster reflexes. “Being ‘quick witted’ and ‘quick on the draw’ generally go hand in hand,” says Melnick. But the tables turned when presented with the larger images. 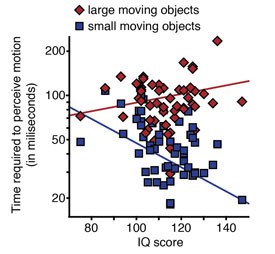 The higher a person’s IQ, the slower they were at detecting movement. “From previous research, we expected that all participants would be worse at detecting the movement of large images, but high IQ individuals were much, much worse,” says Melnick. That counter-intuitive inability to perceive large moving images is a perceptual marker for the brain’s ability to suppress background motion, the authors explain. In most scenarios, background movement is less important than small moving objects in the foreground. Think about driving in a car, walking down a hall, or even just moving your eyes across the room. The background is constantly in motion. People with higher IQ are quicker at detecting small moving objects, but slower when the objects are larger. This counterintuitive inability to perceive large moving objects is a perceptual marker for the brain’s ability to filter out distracting background movement. For example, did the surprising link to IQ simply reflect a person’s willful decision to focus on small moving images? To rule out the effect of attention, the second round of experiments randomly ordered the different image sizes and tested other types of large images that have been shown not to elicit suppression. High IQ individuals continued to be quicker on all tasks, except the ones that isolated motion suppression. The authors concluded that high IQ is associated with automatic filtering of background motion. As a person’s IQ increases, so too does his or her ability to filter out distracting background motion. This surprisingly strong relationship may help scientists better understand what makes a brain more efficient, and, as a result, more intelligent. “We know from prior research which parts of the brain are involved in visual suppression of background motion. This new link to intelligence provides a good target for looking at what is different about the neural processing, what’s different about the neurochemistry, what’s different about the neurotransmitters of people with different IQs,” says Tadin. 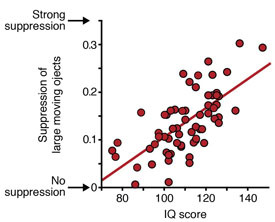 The relationship between IQ and motion suppression points to the fundamental cognitive processes that underlie intelligence, the authors write. The brain is bombarded by an overwhelming amount of sensory information, and its efficiency is built not only on how quickly our neural networks process these signals, but also on how good they are at suppressing less meaningful information. “Rapid processing is of little utility unless it is restricted to the most relevant information,” the authors conclude. The researchers point out that this vision test could remove some of the limitations associated with standard IQ tests, which have been criticized for cultural bias. 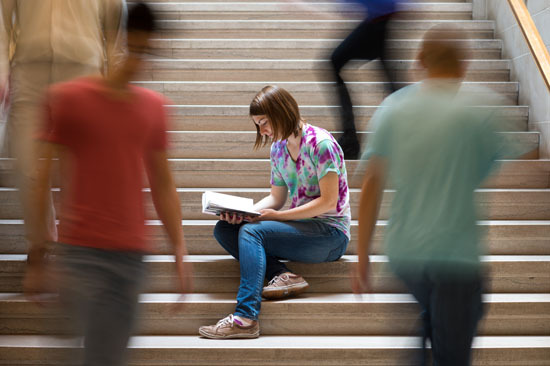 “Because the test is simple and non-verbal, it will also help researchers better understand neural processing in individuals with intellectual and developmental disabilities,” says co-author Loisa Bennetto, an associate professor of psychology at the University of Rochester.